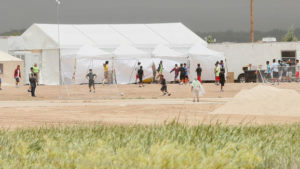 An effort to deliver a little bit of Christmas joy to detained immigrant children in El Paso County spearheaded by the office of Sen. Jose Rodriguez became bipartisan this week and as of Saturday morning has now raised more than 1,000 items so far. There are 2,400 kids and the deadline to get this done is next Thursday, Dec 13. Other members of the Texas Legislature who have chipped in include Rep. Ina Minjarez, D-El Paso, and Rep. Victoria Neave, D-Dallas. Rep. Poncho Nevarez said he was donating on Saturday as well. Former Texas House Chairman Jim Keffer, a veteran Republican from Eastland, said he was contributing $200 worth of the soccer balls for the kids. If you’d like to purchase one or more of the balls for the kids, click this link.